Here is a nice one! It is a Giant size 6"x9" size chrome color postcard. 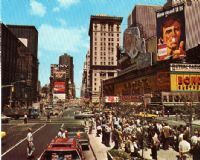 It pictures a neat 1970s era view of busy Times Square in New York City. Look at all those super 70s cars and advertising signs! This is a nice old transportation image! It pictures an early view of a round subway tunnel. Double tracks line the floor. What a crude looking subway tunnel. Around the corner light can be seen. Front of card reads Hudson River Tunnel Curve, New York". This is a nice old Long Island postcard! It pictures an early view of an old churchlike wooden building. Looks like old tombstones at left? Front of card reads "Quakers Old Meeting House , Flushing , L.I. N.Y.". Back of card is divided and postmarked "Flushing N.Y. Jul 24 1934". Condition-Very good as shown, with some cancel marks on front. #1256 White Plains NY Soda Fountain ! This postcard is great! It is a colorful 1910 era postcard view. It pictures the old wharf at Steeplechase / Rockaway Beach NY. Shown is the old paddle wheeler called the Grand Republic. Front is printed "Grand Republic Landing At Steeplechase , Rockaway Beach , L.I.". A nice old amusement park area view! Back of the card is is divided and is postmarked "Rockaway Beach N.Y., July 3, 1913" and has a horizontal bar cancel (which shows lightly through the front). Condition is fair to good with light edge and corner wear as shown. Any other lines or waves are from the scanner and not on the actual image. Your item is shipped to you safely in a rigid mailer. This postcard is great! It is a 1905 era Private Mailing Card postcard view. It pictures the old Hembergers Hotel at Rockaway Beach LI. Shown is the old wooden three story hotel and street view. People line the sidewalk and hotel porch. A sign on the hotel reads "Hembergers Hotel , S. Liebman's Sons Brewing Co. Rheingold & Teutonic" and "Headquarters for Newark Boats". Front is printed "Hemberger's Hotel, Rockaway Beach , L.I. , Steeplechase Dock". A nice old New York amusement park related view! Back of the card is is divided and is postally unsued. Card back is printed "Private Mailing Card". Condition is good to very good as shown, with crease at upper right corner as shown. #290 RP Crown Point NY w/ Canon ! This early RPPC image is a neat one! Apparently this relic was unearthed at Fort St. Frederick at Crown Point N.Y.. It is a breach loading canon and is quite large in size. The front of the card reads "Breech Loading Canon Discovered At Ft. St. Frederick, Crown Point , N.Y. , Over 200 Years Old". Back of card is undivided and is postally unused. Card back has an "A Z O PLace Stamp Here" stamp box. Condition is near mint to mint as shown. Any other lines or waves are from the scanner and not on the actual image.